The Buckner building was completed in 1953 and it was named after General Simon Buckner who fell during the final days of the Battle of Okinawa. He was the highest ranking US officer to be killed in action during the whole of the second world war. 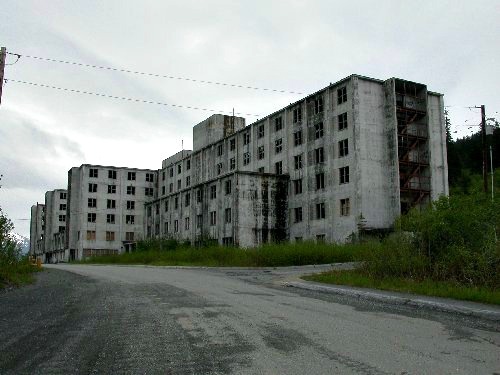 The building was created as a government complex to act as a head quarters for the area and was at one time the largest building in Alaska, and came to have the nickname of the city under on roof. The building stands in the area known as Whittier and the only ways to get there are by boat or through the Anton Anderson memorial tunnel, which is the second longest highway tunnel in north America at a length of 4,100 m.
The building was heavily damaged in the huge earthquake of 1964 and has been standing abandoned ever since. The reason the building has not been torn down apart from the huge amount of asbestos in the building is due to the access routes. It would be an enormous amount of rubble to transport by boat or though the tunnel, and due to its remote location there has never been an urgency to tear it down. There are a number of buildings in Whittier that are quite old and very dangerous. The Buckner complex is very heavily damaged and unstable. Flooding, holes in the floors and crumbling supports make this building very very dangerous. Please do not attempt to enter any of the buildings here unless you have legal permission and a qualified guide to see you around. Almost all of the 160 resident of Whittier live in the Hodge building which was later renamed to the Begich towers. This building was originally built to serve as a hosing area for the soldiers stationed at Whittier. Why there are thought to be so many ghosts here is not known, maybe they just like the quiet or perhaps there's something that attracts them to this eerie town, but you don't get to be known as the most haunted town in Alaska if you don't have alot of spooky happenings going on. There are a number of people living in the town who have had experiences here who are not willing to recall them because they have been so terrifying to the individual, perhaps living in the town means you will have a much higher chance to experience a more power manifestation. 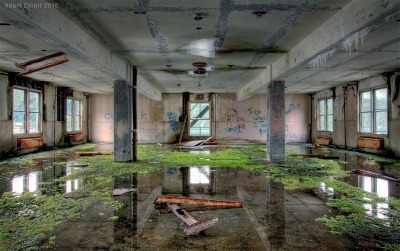 As for the people who have come here ghost hunting they have often got alot more than they had bargained for. The Buckner building has been the scene of a huge number of ghostly experiences which have sent many a ghost hunter running. Stories range from orbs and floating white lights moving through the corridors, to full apparitions of people dressed in anything from war uniforms to general civilian attire. 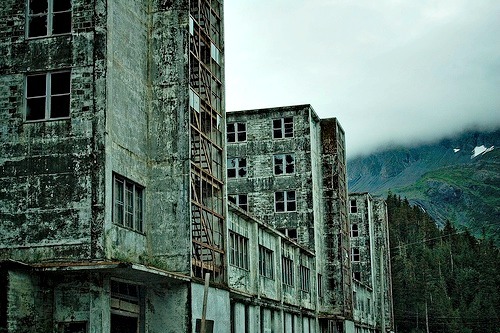 To list the number of different encounters here will be an enormous task and would also get repetitive, but one things for sure, due to the enormous amount of ghostly tales which come out of this place it seems to deserve its title of as the most haunted town in Alaska.